On Mother’s Day Weekend, we asked you to join us in protesting the high cost of insulin by attending rallies, marches, and by signing the Mother’s Day card to pharma. We were blown away by the response – Hundreds of people attended events in 8 cities, and 5,000 people signed the card, in person and online! We wanted to make absolutely sure that the makers of insulin got the message. 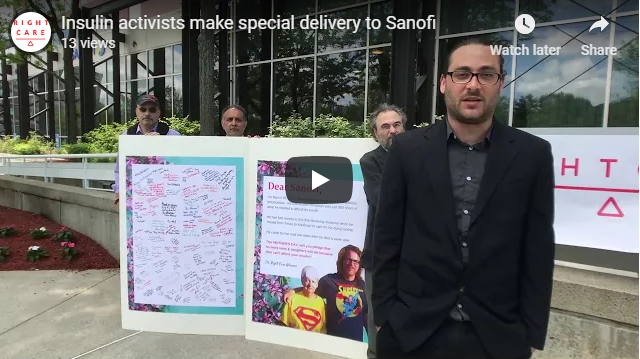 So we delivered the Mother’s Day card to Sanofi Pharmaceuticals – and got their response on video. Please enjoy and share the video to show your friends and colleagues how together, we are standing up to unfair drug prices and making pharma pay attention! Be a part of our Spring Membership Drive!